This is part two in a series. 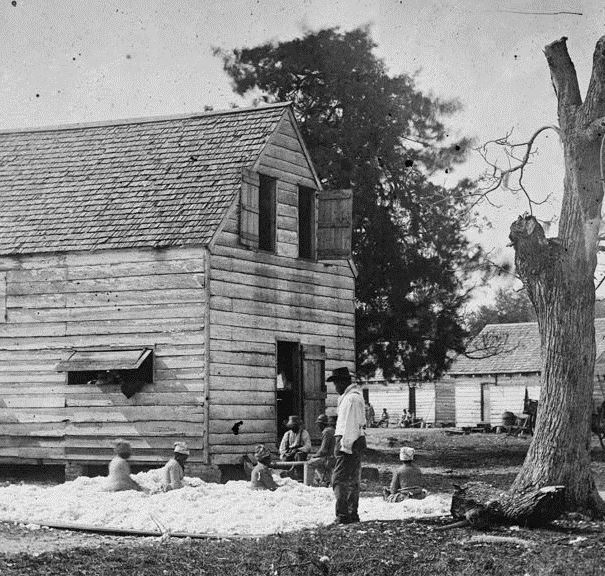 [Detail] – Cotton ready for the gin at Smith’s Plantation in Port Royal, South Carolina. Edward Pierce, an agent to the Federal Government sent to visit Port Royal and the surrounding islands of South Carolina, wrote an in depth anthropological style report on the African American population abandoned by retreating Confederate troops and evacuating plantation owners. Reprinted in the New York Tribune in February of 1862, Pierce documented the daily lives of the slaves, while taking a preliminary inventory of the available land, labor, and cash-crop production at each plantation. Surveying around 200 plantations in a very short period of time, Pierce compiled an informative array of detail concerning the contraband population, including but not limited to their religion, clothing and food supply, and their insistent desire to be free. In addition to the survey aspect of the report, Pierce proposed a plan to reintegrate the African Americans into working society. 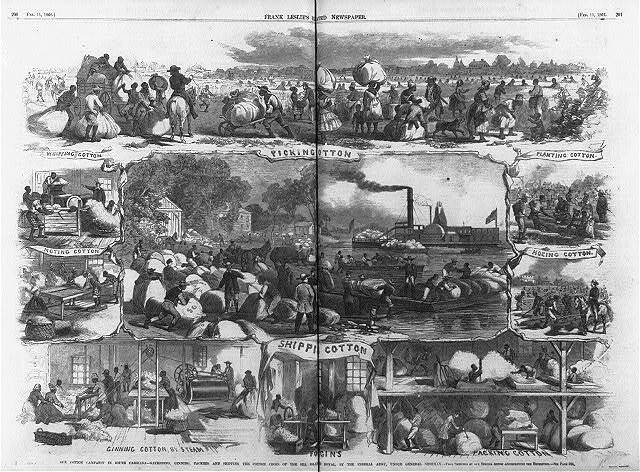 This liberal proposal relied on the cooperation of the government in two ways: to provide wages to the contraband for their labor, and to adopt some form of a plan by the end of February 1862. The longer the waiting period between the initial report and its adoption compromised the effectiveness of the plan, as well as alienated the African American population from those attempting to help them. Frank Leslie’s rendition of the Sea Islands cotton process. The proposal not only provided a reasonable and plausible outcome for the large population, but also provided the needed income to fund the war through the sale of the seized cotton. 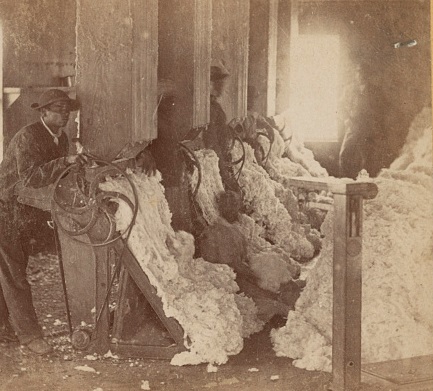 Planting, harvesting, and selling the cotton grown by this labor force also supplied materials to Northern factories, which would then equip Union troops with much needed clothing, tents, and other textiles. It also kept the African American population in control by providing an honorable way of life. The interior of a cotton ginning mill, South Carolina. Wages were only one way that Edward Pierce proposed to help the African American population assimilate into free society. He also recommended that the need for qualified teachers to Port Royal to teach arithmetic, writing, and reading be advertised among the Northern abolitionist and missionary groups. Setting the stage for what was to come, Pierce provided the President, the Secretary of the Treasury, and American people with an outline to successfully integrate the African Americans into a free society. Edward Pierce, “Light on the Slavery Question; Negroes in South Carolina: Report of the Government Agent,” New York Daily Tribune, February 19 1862. Pierce, Edward L. “Light on the Slavery Question; Negroes in South Carolina: Report of the Government Agent.” New York Daily Tribune, February 19 1862. This entry was posted in Memory, Reconstruction, Slavery and tagged African Americans, contraband, cotton, Edward Pierce, Port Royal Experiment, Reconstruction, Sea Islands, slavery. Bookmark the permalink. What happened to Pierce’s report? What was the response of the President, the Secretary of the Treasury, and the American people? This article is well written, but it is not complete. Obviously the nation failed the Black population and thrust them into centuries of misery. It may point to just how great a tragedy was the assassination of Lincoln. Lincoln and Chase were highly in favor of Pierce’s report, and pushed to continue his proposal. I’ll be detailing all of that good stuff in the next few posts in relation to this series 🙂 Yes, the nation did fail to help the black population right after the war-and this was all because of Andrew Johnson’s leniency toward the Southern states and Confederate landowners. The rest of the posts in this series will talk about the positives that the Northern missionaries enacted at Port Royal, and how Reconstruction should have gone, as well as where the nation failed at the war’s end. Thanks for the question, and I hope you keep reading!